If you've ever experienced difficulty concentrating, then you know how it can take your attention away from any task that is necessary to complete. You may daydream about a million other things, lose your train of thought mid-sentence, or feel all around fuzzy and confused. At times this can be scary, because the mental fog can become so thick that you may worry that you're going senile or developing Alzheimer's. The fact is, however, that this is a common symptom of menopause that results from a fluctuation of hormones, among other things. Between night sweats and sleep disorders, which can become more prevalent during menopause, comes day after day of fatigue. This symptom is usually defined as general tiredness or exhaustion that makes it hard to function both physically and mentally. You may find yourself blanking out and closing your eyes to relieve the tired feeling. It's extremely difficult to concentrate, especially on complex tasks, when all you can think about is how much you want to go to sleep. In this fast-paced world, many people are not in the moment. With all the technology and social media around, it may feel like there is so much to catch up on and so many people to talk to. This will not only cause difficulty concentrating on mundane tasks, but personal relationships may also be affected. Instead of having a heart-to-heart with a loved one, or completing a personal artistic endeavor, you may just check recheck your email or flip through the channels on TV. It could also just be that your routine is extremely repetitive. Experiencing change and growth is natural and healthy for any person, so sitting in the same setting, doing the same tasks each day can eventually cause "burnout," of which difficulty concentrating is a classic symptom. Try to push yourself outside of your comfort zone, try new things, and set goals for yourself. Hormonal shifts during menopause can cause a decrease in neurotransmitters that inspire calm, such as endorphins, and an increase in hormones that deal with stress response, such as cortisol. The combination can increase feelings of anxiety and make you worrisome about minor things that would have never bothered you in the past. In such cases, it is very common for these anxieties and worries to interfere with daily tasks. Just like for the other parts of your life, it is important to keep a balanced diet during menopause. Women can become much more sensitive to nutritional deficiencies during this time, because aging and hormonal deficiencies can hinder the absorption of macronutrients. At the top of the nutrient list, omega-3 fatty acids and B vitamins will enhance you mental clarity. It is helpful to get a blood test to make sure your levels are up to speed if you are experiencing difficulty concentrating. 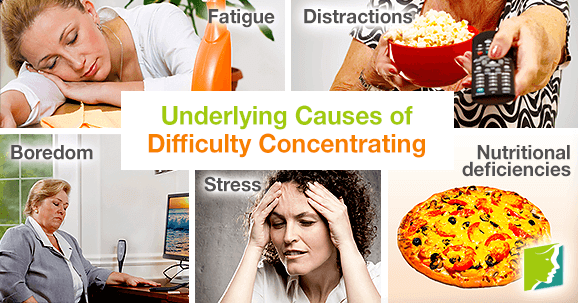 Be aware of the many causes of difficulty concentrating so that you can adjust your lifestyle accordingly. Practice relaxation techniques to de-clog your mind and bring you back into the moment, and make sure to change up your routine a little through the week to stay engaged. Although at times it can be troubling, it is very common and will likely pass as your other menopause symptoms cease as well. Difficulty concentrating may be more than just a sign of aging. Learn more about how to recognize a lack of concentration due to menopause here.